The other night I did what I have not done in a long time. I went to a movie!! My friend Melinda talked me into it. We went to our neighborhood movie theater which happens to be the North Park. I love the North Park so much that when I was on the phone with Leonard Pennario before he got to Buffalo, I mentioned it to him. This was the second time we talked on the phone and we were making plans for his visit here and I remember saying, "Mr. Pennario, maybe we could go to the movies at the North Park." That was more practical than the suggestion he had just floated, which was, "Maybe we can go to Crystal Beach!" 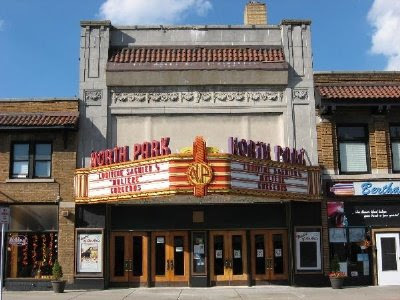 Above is a picture of the North Park though I wish I had one of the theater at night, because its marquee is so bright and pretty. Note to out-of-towners: Here in Buffalo we do not have to go to movies in crackerbox suburban theaters. We go to big theaters like the North Park. And it is perfectly normal to walk to them. Here are two things I love about the North Park. Number one you walk in and there is an actual gentleman in a little booth, in the middle of the lobby. You converse with him. It is not like those theaters where you have to understand the slug squawking at you through some kind of bulletproof glass. Number two the concession stand is in the back of the theater and you can watch the movie while you are ordering your popcorn. Very important! Also if you are meeting a friend and the friend is not there yet, you can hang out in that back area, eating your popcorn and watching the movie, until your friend gets there. That is what I did the other night. The movie we saw was "The Reader." It was good although it should have been aggressively edited. Wow, these filmmakers were in absolutely no hurry. If there was one scene of the kid lighting a cigarette and puffing away abstractedly, there were a thousand. One day I would like to see an actor act without using a cigarette as a prop, you know? But oh, they all need that cigarette. That cigarette just makes things so much easier. After the movie Melinda and I went and had a glass of Pinot Noir at the Sidebar across the street. The Sidebar has that beautiful piano and if my chops were in better shape I would have been playing Chopin. But the other night it was not exactly a piano-and-pinot-noir kind of place. There were guys at the bar and they were bellowing. Here is a photo someone took of the view from the Sidebar. You can see how close the place is to the North Park. 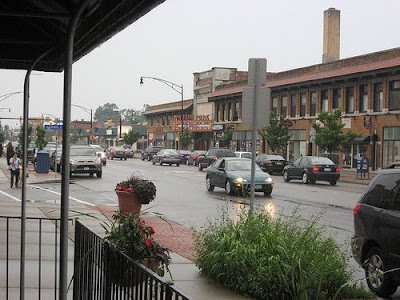 You can also see Hertel Avenue which figures in the amazing story I am about to tell. While we were at the Sidebar Melinda realized she was missing her cell phone. She rushed out into the snowy night to find it. She seemed pretty confident she knew where it was. And lo, there it was! It was in the first place she looked. It was in the middle of Hertel! A car had run over it and it still worked! That is almost as big a miracle as the time my friend Peggy Farrell dropped her cell phone in the toilet and it still worked. Things like that are far more dramatic than "The Reader."